Violin Humidifier and Dehumidifier: Two-ways Humidity Control Pack. Music Sorb is More than a Violin Humidifier. 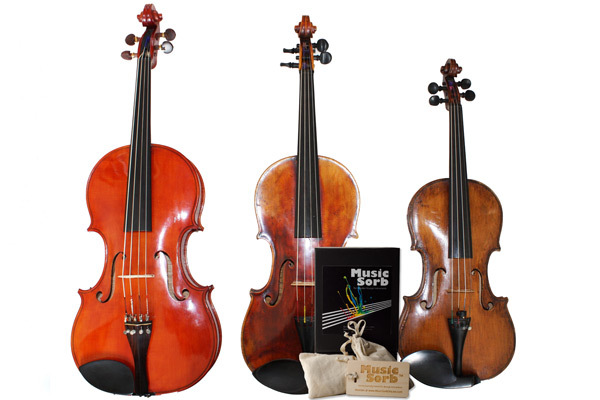 Music Sorb protects your violin and viola both from high- and low-humidity damage. Music Sorb does not need to be constantly refilled or maintained. 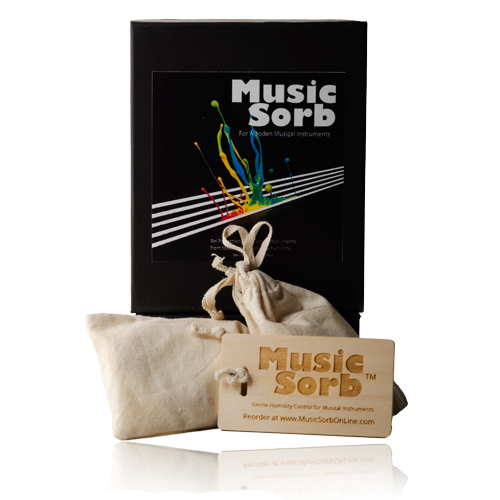 Music Sorb is dry to the touch even while holding moisture. Nothing to spill. Nothing to damage your wood instrument. To protect your violin or viola one way or another from humidity damage, you need more than a typical violin humidifier. You have a few product or system choices that are supposed to work. Most, if not all, try only to keep your violin from getting too dry…releasing moisture no matter the humidity range. Most require constant vigilance and maintenance and can be risky for your wood instrument if not controlled very carefully. We have developed a dedicated product for violins using an advanced technology. This innovative product allows you to keep the correct relative humidity range (45%-55%) for your violin in the simplest way possible and addresses all the possible concerns and complaints we have heard from professional violinists about usual violin humidifier. 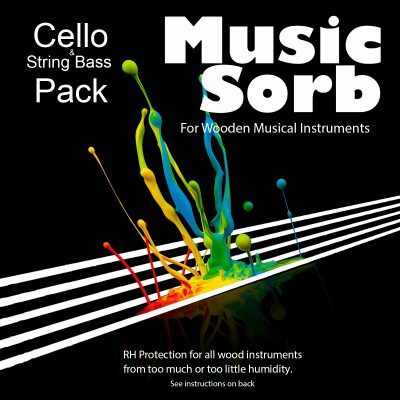 Music Sorb, as opposed to a normal violin humidifiers, protects your wood musical instrument from both high and low RH because it’s able to release or adsorb moisture depending on the level relative humidity. What are the main difference between a violin humidifier and Music Sorb Advanced Humidity Control System? A violin humidifier does not protect from high humidity level damages. Most violin humidifiers need to be refilled weekly or on a regular time schedule. Some violin humidifiers put your instrument at risk by leaking in/on your instrument. Our Humidity Control Pack for Violins is an advanced two-ways humidity control system from which violins and violas gain extraordinary benefits. 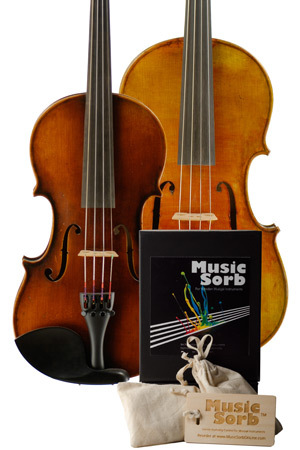 Music Sorb’s Desorption Technology to protect against low humidity is especially important for violins to fight warping, cracking, and fractures of any part of the violin. Music Sorb’s Adsorption Technology is important for violins preventing them from swelling and warping. Obviously, any violin should be protected from high humidity. In all circumstances, using a high-quality, tight violin case with Music Sorb, or any other violin humidifier, is preferable for maintaining the right RH. Obviously, you need to be reasonable in your violin care otherwise. Music Sorb, as any other violin humidifier, does not protect your instrument from temperature extremes. Extreme temperatures can cause serious damage, especially when combined with extreme humidity. Like your pet, you do not want to leave any wood instrument in a hot car. Both the trunk and the passenger area of a car in the summer can get over 150° F (>65° C). Extremely high temperature wreaks havoc on the violin bridges, frets, and neck. Even direct sunlight can damage the finish. Literally everything is thrown out of tune. We recommend the use an hygrometer while being aware that hygrometers are notoriously inaccurate. Discover how to test yours. Music Sorb removes the threat to your musical instrument caused by sudden changes in moisture. 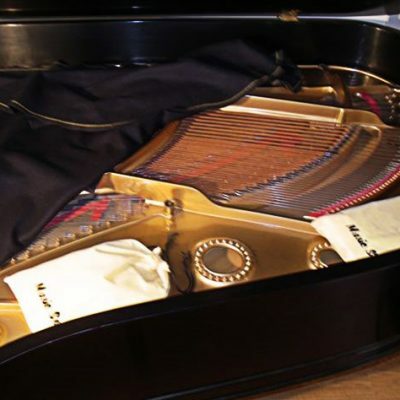 Controlling the moisture is essential to preventing damage to the wooden structure of your instrument. Protect your precious violin or viola. Buy Now Music Sorb and immediately start to enjoy all the benefits and simplicity of our innovative technology that mantain stable the correct humidity range inside your case.